To me, February always seemed to be proof that winter is one month too long. And indeed, this first week of February looks a lot like the first week of January, although the current temperature is hovering around 32 degrees Fahrenheit (I don’t think I need to mention how cold it was in early January). Even the snow from late December is still on the ground, with a couple inches of fresh powder added from this week’s showers. While the temperature has reached above freezing on several days in the past few weeks, there is just so much snow and ice covering the landscape that it will take a prolonged period of temperatures constantly in the upper 30’s or even low 40’s to melt this stuff. But with next week’s temperatures forecast to be in the teens and 20’s, this warming period doesn’t appear to be coming anytime soon. Though the landscape remains immutably constant, some of its inhabitants are beginning to sense a change. Birds have begun singing their spring songs on warm days in response to the increasing day length; last week Black-capped Chickadees began their vernal two-note “spring’s here!” choruses, and this week Northern Cardinals have begun to chime in with their jubilant “cheery? cheery? cheer cheer cheer” melodies. 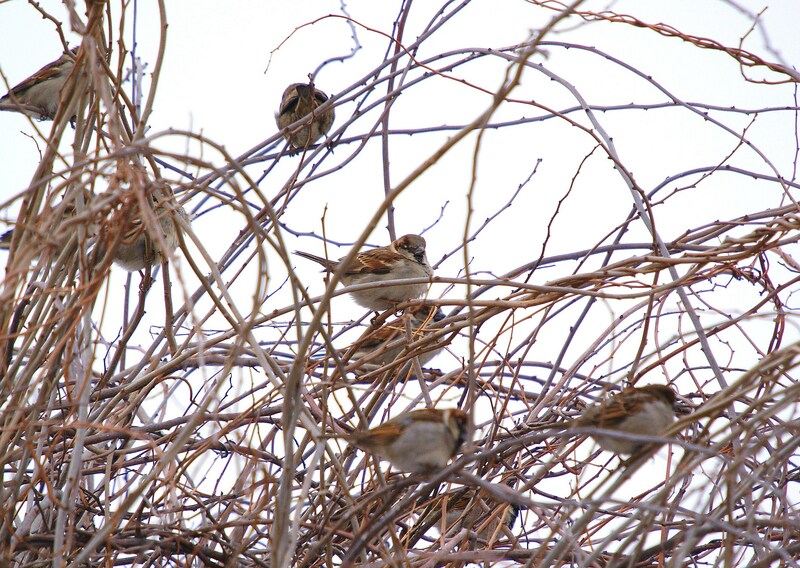 House Sparrow flock roosting in trellis at entrance to Interpretive Center, 2/5/10.